STIHL petrol long-reach hedge trimmers are used for all jobs which are out of reach of the classic hedge trimmer. 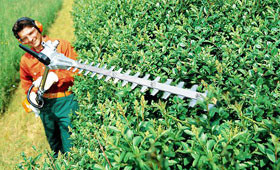 With these models you can trim tall and extra-wide hedges without the need for scaffolding or working platforms. Available in two lengths The HL 92 and HL 94 also come with the efficient 2- MIX engine with ECOSPEED load control, ideal for working in noise sensitive areas.